It’s amazing to notice we got an impressive number of incoming calls and contacts for BI migration projects. Migration of a project is always something difficult : usually, customers have already invested to buy an expensive commercial BI platform, and invested a lot of time in their Datawarehouse & Bi Platform. So it’s not easy to tell them “let’s restart”. It’s amazing, because we have a dedicated services to help customers to migrate their legacy BI platform for years now, with interesting migration projects from Cognos and Business Objects to Vanilla. This team “live its life”, doing some projects, getting more and more experience, but as we don’t promote this activity, it’s just a silent activity. But recently, incoming call are more to discuss about Open Source migration platforms (Jasper, Pentaho, Talend) … so situation is different, and it’s also much easy to discuss about such migration, because we can access the documents and run migration scripts. Why they want to run away from such Open Source BI platforms is not the subject of this post … maybe a next post … but there are valuable reasons to run away now. About ETL, situation is confused those days (I will not comment the Talend situation, neither the absorbtion of Kettle by HDS). Customers are reviewing their strategy when they have already invested a lot in their ETL backbone … and ETL is not visible for end users, so they don’t understand easilly the interest of such migration. 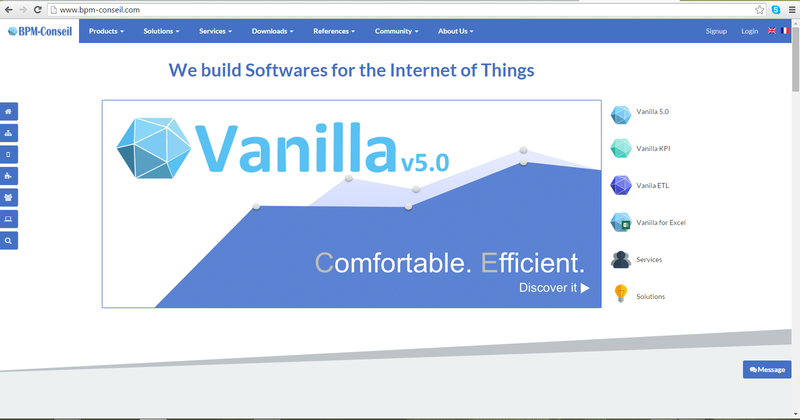 Last year, first in may, then in september, it was an important decision to postpone Vanilla 5 delivery, because it was not “bullet proof”, and other subjects like documentation & Website update were not available. This decision had impact : we kept silent, and we work hard on Vanila 5 (no comment on other editor’s strategy). Our integration team started using it for our projects, and some partners get early access to Vanilla 5, with nice messages. During this year, we use Vanilla to develop, we make it stronger, we added some features to make it easier to use (like maps and olap view inside kpi interface), keeping in mind we are going to release it. We reviewed also the packaging, to separate the Core BI modules and the ETL modules, and we developped a specific version Vanilla Big Data Analysis. We took also this additional time to develop 2 new modules : Vanilla Hub and Vanilla for Excel … we are in peace with version 5, it’s already deployed for most of our customers, with only good feedback. Version 5 will be the most important release for Vanilla, maybe also the most difficult to achieve … it was a long journey, but we are soon reaching the promise land ! Early version is available from our WebSite, in the download section, don’t hesitate to download it to enjoy a fresh BI platform, with cool features ! We are proud to provide an early version of Vanilla 5, Big Data Analysis, a dedicated platform built on top of Vanilla 5, to provide data analyst with the tools & platform to collect, store, transform, analyze and display data coming from numerous sources, in various format. Subject is no more to collect data and store it in Big Data : subject is to provide analysts with additional data (weather, maps, finance, economic are “standard”) and to allow them to build analytical business model on those blended data, then run process to analyze those data and display result through human interfaces. Even it’s early version, we have already customers who believe in our project and decided to move to Vanilla 5, Big Data Analysis : this cover customers from Pharmaceutical industry, Hospital sector and Retail Business. Data Analysis challenge is there : don’t miss a chance to enjoy playing with your data soon ! 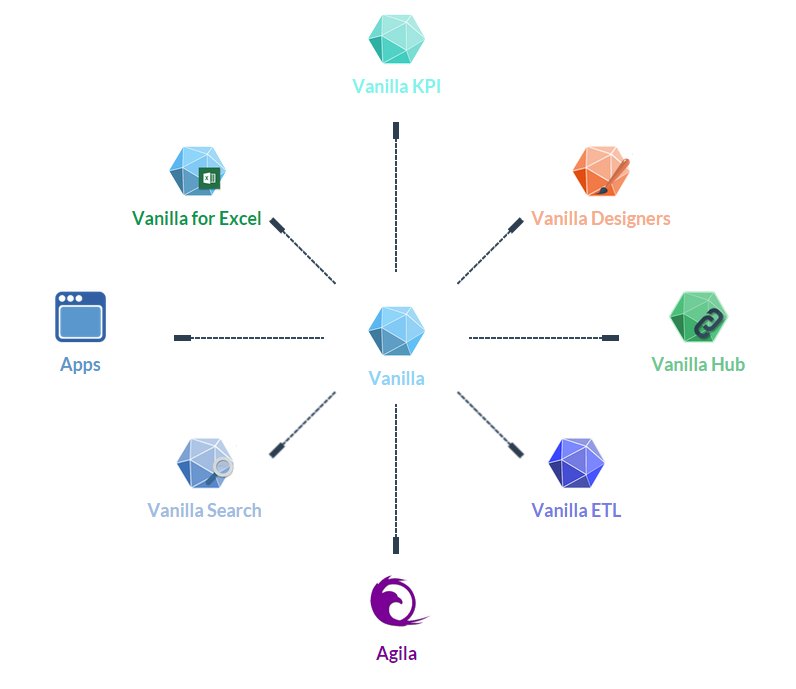 Vanilla Hub provides an easy and clean interface to declare custom API that can process data input coming from Web Services or complex Xml data file. Vanilla 5 comes with new packaging : h2 server (in parallel of the standard mysql and pgsql servers), that can be downloaded and deployed in few minutes. This will make easier the first discovery of Vanilla, for those who want to see the portal and some of its awesome features (olap browser, maps in dashboard, aggregation of multiples reports …). In fact last h2 package we provided was with Vanilla 3, “a few” years ago” (september 2010), a package that had annoying limitation (no olap support), With Vanilla 4, our tentatives with other embeded database such as derby were also “so so” : multi thread problems at database level (very annoying to run a report, an etl process and an olap view, even in demo mode ! ), so we offered for download a VBox server … but some of our contacts had problems with Vbox … so difficult to please everybody when you have worldwide downloads. H2 server is available from our WebSite, www.bpm-conseil.com, in the download section. For those who visited our WebSite, I’m certain you have noticed the refresh version of our Website, with more focus on our strengths : Full Open Source Platform (server and designer), Kpi Module, Excel Add-Ins, Big Data Integration, Internet Of Things dedicated platform (with multiples connectors to various source of information). At a key moment of our project, it was important to update our WebSite to have it align with our platform position. I was amazed by the good feedbacks from friends & partners with this WebSite (some liked the References we displayed, important companies and governmental agencies, where other liked more the “products” section, and enjoyed putting an image on some of their mail contact).